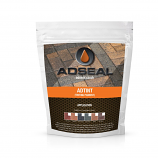 AdSeal Stone Protector has been uniquely designed to give outstanding results on natural materials such as Stone, Slate, Travetine, Terracotta, and even Clay (in clay paviors). Geological materials have different physical and chemical structures from man-made products which is why they need special treatment. For a Matt, colour enhancing finish, apply one coat or, if a delicate sheen is required, apply two coats. Developed by our own specialist design team, along with consultant organic chemists, this fantastic product offers ease of installation with considerably improved performance and longevity. i HAVE JUST HAS HAD 100SQM OF RAJ BLEND SANDSTONE LAYED IN THE GARDEN. THE JOB IS COMPLETE AND NOW AM LOOKING TO GET THE PAVING SEALED. TWO QUESTIONS WHEN SHOULD I APPLY THE SEALANT AFTER A NEW LAY WHAT SEALANT COULD BE RECOMMNDED FOR A NATURAL MATT FINSIH AND ONE FOR A WET LOOK. I HAVE SEEN ON THE PAVING EXPERT SITE THAT Heavy Duty Sealer IS A GOOD OPTION BUT I WANT TO BE SURE. 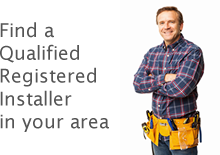 We have read reviews on the going expert site that have lead us to want to try your products. We have a slate patio we have juts completed and the client wants it sealing to bring our the colours in the slate. 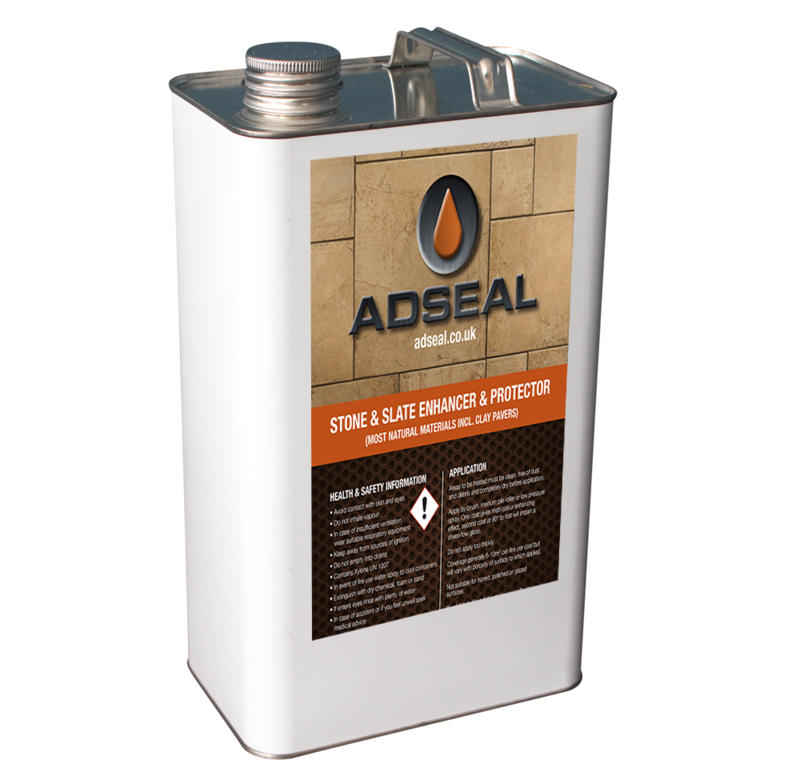 Do you stock anything water based for slate that can be applied immediately after install? Unfortunately the one drawback of water based sealers is that they don't enhance the colours in the paving so leave it looking more like it does when it is dry as opposed to when it is wet. Will my Stone sealer go off? As long as the container is closed and it is protected from frost it will keep for a couple of years. What is the best sealer for black limestone? I recommend using the stone and slate as some black limestone can be quite nonporous and this sealer is a bit thinner so penetrates better, I also suggest scrubbing in the first coat to help aid with the adhesion. I have a terrace of indian sandstone which has developed terrible black spot lichen everywhere. I have pressure hosed off as much as possible but cant get it all off. If I could keep it like it is that would be ok even tho some spots remain. Would your Stone and Slate Protector prevent the regrowth of the lichens and algae. Could you advise which ( if any) of your products would be best suited for the above? I have been looking at water based products for eco reasons and also because I understand that solvent based products cause pooling when it rains as they compromise the breathability of the stone? I would like a product that enhances the colour of the sandstone and also protects it. I am not looking for a high gloss finish, just a slight sheen which brings out the colours. Any advice on the types of product and advantages/disadvantages would be much appreciated. Ok first things first, when initially laid all sealers will cause water to pool, but after it has weathered in a bit it will stop pooling and drain off normally (like when you freshly wax a car). Please may you advise if you have a suitable product for enhancing existing natural stone slabs without changing the overall colour. Over time, fading has occurred in some areas and we wish to bring the slabs back to their original natural buff colour without actually changing the overall colour. We are looking for a matt finish and, once this procedure has been carried out, we then wish to apply a natural stone sealant. Thank you for your advice and assistance. Applying a coat of sealer will enhance the colour of the slabs and leave them looking as they do when they are wet. If the flags look ok when they are wet then all you need to do is apply a sealer, this will leave the flags looking like they do when they are wet and it will protect them from stains and general wear and tear. I am needing to brighten up my charcoal sandstone/limestone patio. What's the best product you have to do this? 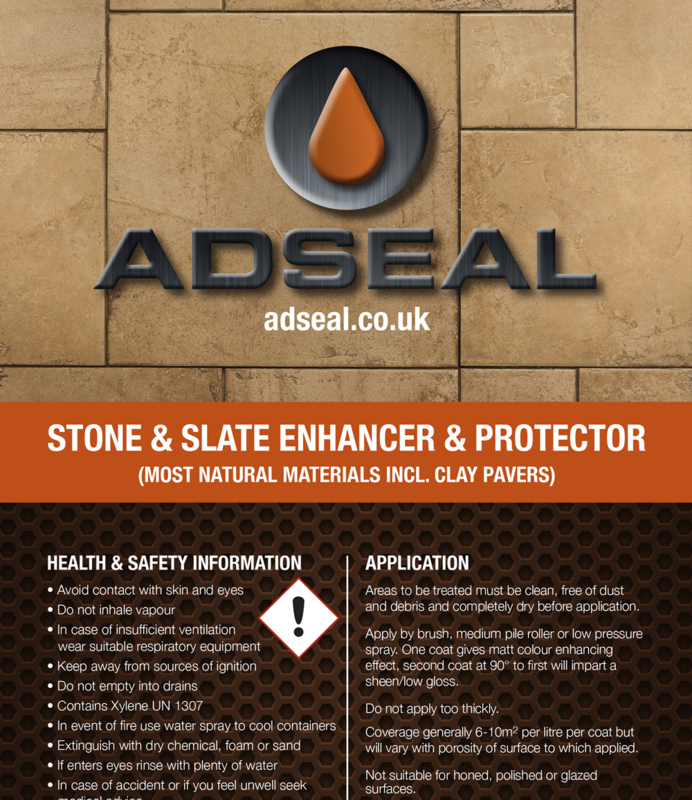 I would recommend using our Stone and Slate protector. Hi I have a slate patio which has never been treated. 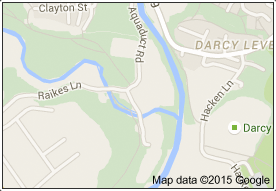 I would like to enhance the colour and put a bit of a sheen on it can you suggest a product please. Which sealant won't change the appearance of my indian sandstone floor? What is the best sealant for a wet look finish for Indian Sandstone paving? I am looking for a product for my indian rainbow sandstone patio I want a wet look finish the area does not get much sun and is susceptible to Moss what can you recommend? Sealing a surface, especially your driveway is beneficial in the long run, as it provides a protective coating for your tarmac, block paving, stone and concrete. Just as rust proofing is advantageous for vehicles, driveway sealing protects your driveway�s surface from wear & tear. I have a paved patio which has stone or concrete slabs and in need of protection from stains and general annual growth. Can you advise what is the best product in your range to use? If you are uncertain whether the flags are stone or concrete I would recommend using our Stone and Slate Protector (link below), this will be ok to use on either surface. I have just had a patio laid with sandstone slabs. Could you please tell me which is the best sealant and protector for these? Thank you. 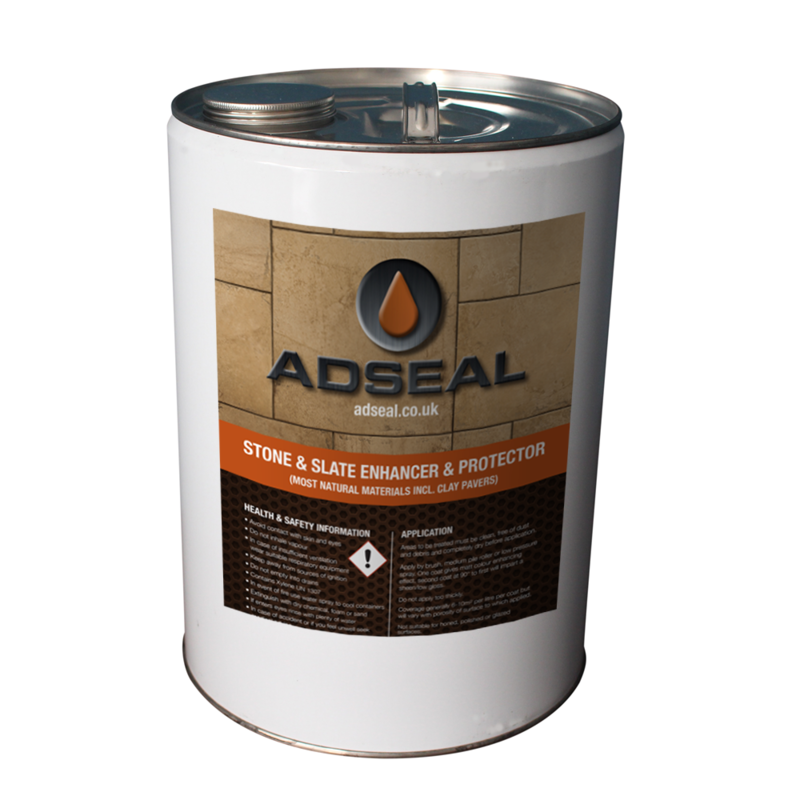 I usually recommend the Stone and Slate sealer as this offers a matte finish with one coat or a satin to light gloss finish with 2 coats. They can only cause an issue whilst drying, once it is dry its fine, usually not much more than 2 hours (depending on the weather). But unless they walk over it as you are actually applying the seal it will only cause a little bit of irritation to the pads, nothing that would require treatment. I've just painted this on with a roller on some teak indian sandstone and it has come out really patchy where the roller has overlapped its has gone double dark if that makes sense. I didn't have enough so I was gonna order 2 more cans hoping that a second coat will make the cover even. What are your thoughts?